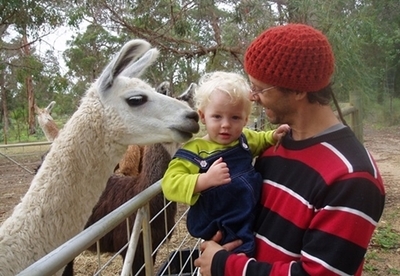 Llama's make wonderful family pets, provided you have enough space and time to care for them. 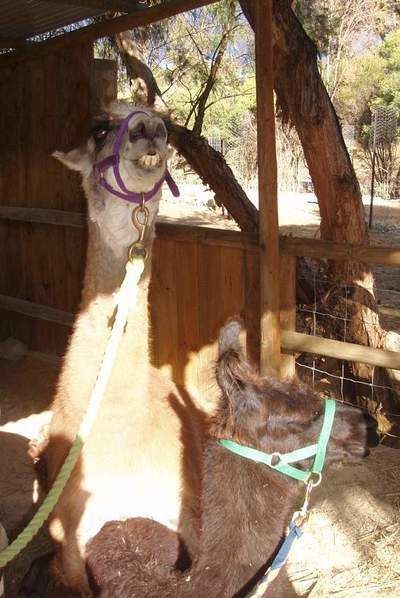 Breeding Llamas is relatively easy. 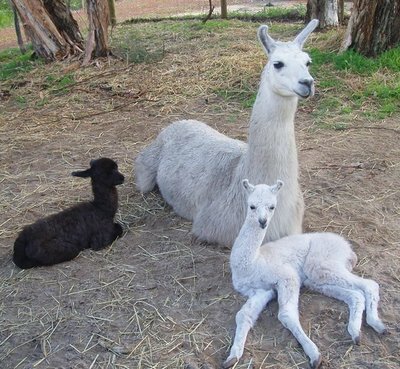 Llama's are "induced ovulaters" which simply put, means once you mate them, they then ovulate. This is great as you can pick and chose exactly when you want a cria (baby llama) to be born. When I was breeding these stately animals, I always aimed for a March/April birth or September/October as the weather is not so harsh then. Llamas are born with fleece however cannot regulate their body temperature as well as a llama that is a few weeks old, so both too cold and too hot can be trouble. Llamas very rarely have twins and they take around 11 months for a pregnancy. They are often pregnant after the first mating and you can tell if they are by bringing the male to the female several days later. If she is pregnant she will spit at him quite vehemently, and this is quite funny to watch. During their pregnancy, you generally cannot "see" that they are pregnant as they do not have a big "bulge" like we humans do, so you have to do the "spit" test a few times as they can lose the baby early in the pregnancy. 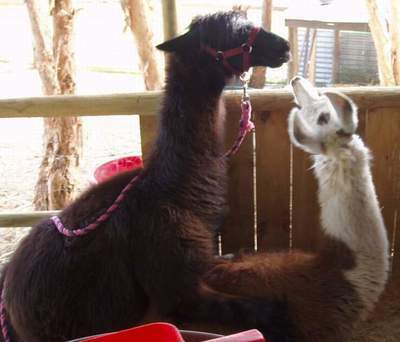 When I mated my llamas, I preferred to lock them in a stable as I had more control over the situation then. The male will jump up and if the female is receptive, which they generally are if they are healthy, she will then sit. The male then commences mating and makes a very strange sound - which sounds like a cross between a gargle and a snort. Some alpaca breeders mate their animals once a year however I would not do that as I think it is too quick, and I used to mate generally every 18 months or so. Llamas do have some quirky ways about them, however they are generally a delight to breed, take for walks, take hiking, and have many other uses. This llama was one of my favourite llamas (Gaia) who had such a lovely nature, and fell pregnant the first time she was mated. Having had to move back to the City, I miss my llamas and the fun and pleasure they used to bring to my life!